Sometimes, being in the driver’s seat isn’t all it’s cracked up to be. For millions of drivers, the seats we spend hours in feel like a sore counterpoint to the otherwise pleasant experience of riding in a modern automobile. Uncomfortable, impersonal and primitive, they offer nothing if not room for improvement. But what if the car seat were smarter—intelligent enough to provide a better driving experience? Accenture Labs is making this a reality by giving the car seat a 21st century makeover. As part of the digital reinvention of industrial manufacturing known as Industry X.0, the team rethought the engineering process behind the humble bucket seat, adopting an intelligence-driven, adaptive design. Designing a car seat is complicated and can take months to conceptualize and engineer. In fact, it is one of the most complex car systems to design, second only to the engine. 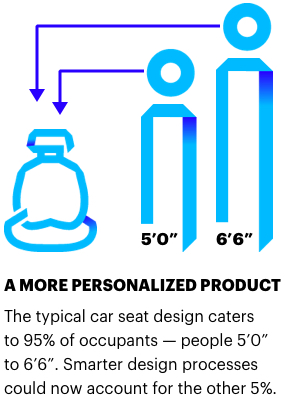 Accenture was challenged to create a new approach to product design that would slash the timeline and bring the car seat into the modern, digital era. Accenture Labs’ three-step approach to product engineering begins with product conceptualization through crowdsourcing and artificial intelligence, progresses with design aided by virtual and augmented reality technologies, and concludes with prototyping that leverages cutting-edge tools to cut costs and time. This approach can make a tremendous impact on the automotive industry, for example, in which the manufacturing process can take as long as 36 months, with prototyping and simulation accounting for one-third of total costs. "This convergence of a whole spectrum of breakthrough technologies from AI, edge intelligence and extended reality to 3D-printing and advanced analytics in this era of Industry X.0—it’s a game-changer for product development." Accenture Labs’ process began with asking consumers what they want from their ride. Traditional field research takes months. But by harnessing artificial intelligence, crowdsourcing and scraping social media conversations, they gained consumer insights in just a few days. First, they mined data across major social platforms to find out what people were saying about car seats. From this, they extracted trends using AI algorithms to paint an accurate picture of the features consumers are actually interested in. Now armed with an accurate understanding of the problems, Accenture Labs set about working on the solution. The first feature they sought to integrate into the new seat was embedded sensors. These would gather a variety of driver data, like weight, height, posture and body temperature, while also monitoring behavior to inform other systems. Next came the actual design of the seat itself. In the past, engineering teams traditionally relied on CAD software for modeling, but these designs only existed as digital schematics. Engineers couldn’t interact with the seat or simulate how the sensors would function in the real world without building a physical prototype. But prototyping is an expensive, protracted undertaking: A seat must be fabricated, installed in a vehicle, a professional test driver hired, an obstacle course erected, etc. For each minor refinement to the design, the entire process needs to be restarted. What the team needed was to work in the data it had mined and simulate the functions of the seat sensors before anything was built. The designers converted their CAD drawings to 3D, bringing the schematics to life through mixed reality headsets. Specialized software seamlessly solved technical differences between the CAD drawing and 3D model. This “digital double,” akin to a hologram, enabled engineers to manipulate the seat in three dimensions and see changes to the model in real time as they’re made in the CAD software. With a fully realized design in hand, engineers at Accenture Labs moved onto prototyping the end-user experience. Using a rudimentary simulator rig and Oculus Rift Virtual Reality headset, engineers simulated the experience of riding in a vehicle outfitted with the new seat. The headset’s motion sensors detect the user’s position, producing similar telemetry to what can be expected from the embedded sensors designed into the CAD model. Accenture Labs’ innovative car seat prototype, demonstrated at key industry conferences, garnered strong interest from automakers, paving the road for these innovations to add to the safety and comfort of drivers. As Industry X.0 continues to redefine manufacturing with bleeding- edge technology like mixed reality design and virtual prototyping, sectors ranging from the automotive industry to aerospace will see significant disruption and be able to pivot to new business models by deploying new services. and conditions outside the vehicle. a phone, to slow the car down accordingly. For auto manufacturers, the time and cost savings realized from new seat designs will enable them to develop other innovations and services that can add to the value of the vehicle and their bottom line.